Kumara skin has a special sort of fibre which has a protective role against cancer, so leave the skins on when possible. Kumaras are versatile, can be baked or stuffed as you would potatoes. Store in a warm place - not the fridge. 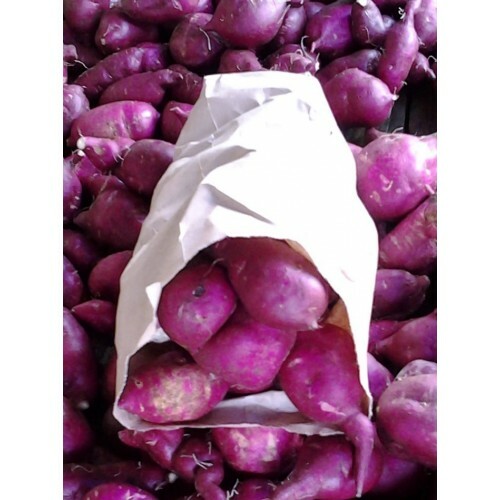 Can be boiled, steamed, mashed, in soups, stir frys, on barbeques, or in pies or quiches. Food experts around the world agree kumara is jam-packed with health benefits. Kumara is a good-health heavyweight packed with anti-oxidants, vitamin E and beta carotene - all of them champions in the fight against cancer. Its high fibre assists cleansing & controlling food intake by helping you feel full. Its low Glycemic Index (GI) enables you to enjoy sustained energy levels. 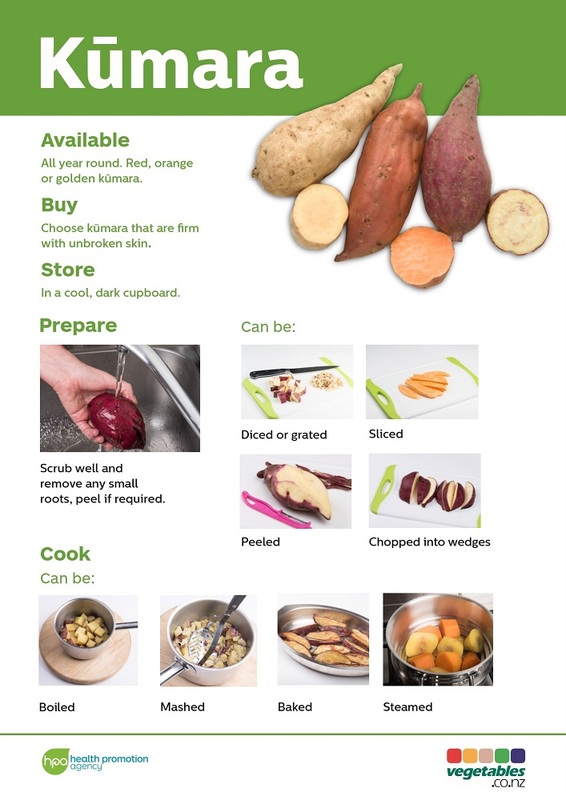 A study in the United States showed that the nutritional value of kumara with its fibre, complex carbohydrates, protein, Vitamins A, C & E, iron and potassium achieved a score of 184 – outstripping its nearest rival by a full 100 points! 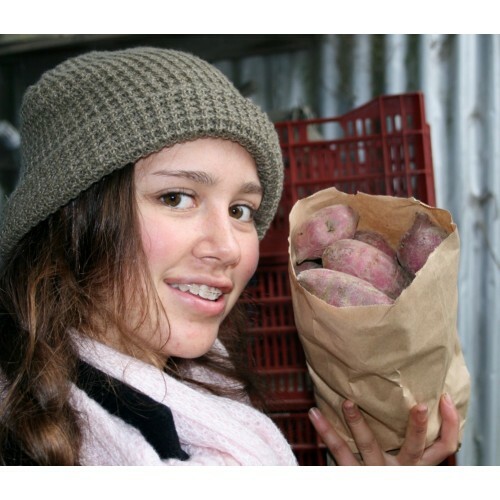 Kumara is the 7th most popular vegetable in New Zealand. Prick the skin & place in 180ºC oven & bake for 45 to 50 minutes. Boil for 10 minutes, peel & cut into strips. Heat oil & cook until golden. Drain on paper towel. Sprinkle with brown sugar, salt or nutmeg. Cut into 1cm thick slices. Brush each side lightly with olive oil. Season with salt & pepper if desired. Place the slices on a baking sheet & bake in a preheated oven for 15 minutes. Turn the 'chips' until both sides are lightly toasted. Place whole unpeeled kumara in boiling water & cook 35-45 minutes. Drain, peel & mash. In a shallow pan, heat vegetable oil & add kumara strips. Saute for 5 minutes or until brown & tender. Remove from hot oil & drain on paper towels. Sprinkle with salt or sugar. Wrap medium-size kumara individually in heavy duty aluminum foil. Place on the grill & cook for about 45 minutes or until tender. To hasten, boil 10 minutes before wrapping in foil. Wrap medium size kumara in heavy duty foil & place in the coals for about 45 minutes or until tender. To hasten, boil 10 minutes before wrapping. The natural long shelf life of Kumara is because they are self preserving through the natural process of converting starch into sugar. Long life is extended because kumara has a perfectly natural ability to heal itself if damaged, for example being skinned, cut or bruised during the harvesting process. The huge health supporting values of the kumara together with its naturally very long life means that it has to be the single best vegetable for any family. It is a vegetable with substance. Keeps you vital: A good source of vitamins A, B6, C, E & other essential nutrients such as calcium for bone health, iron for healthy blood & potassium which regulates both overall body fluid levels & blood pressure. 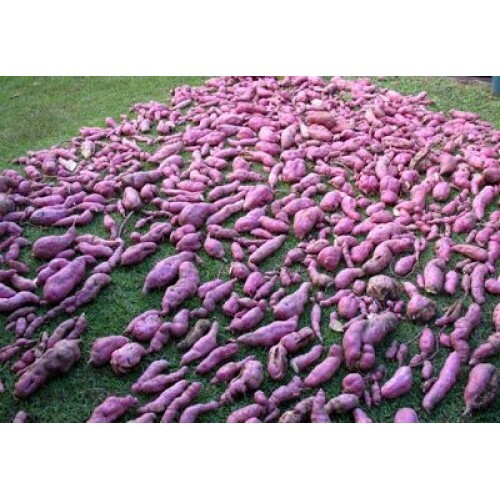 Eat kumara to give your system excellent nutritional support. Keeps you clean: With more dietary fibre than Oatmeal, kumara is an excellent means to ensure your digestive tract remains naturally cleansed and healthy. Actively fights health risks: The best defence is offence & kumara is loaded with anti-oxidants that take the fight to the free-radicals; known triggers of cell deformity including cancers. Delivers sustained energy: Kumara, with 100 calories per 100g latent energy delivered as Starchy Carbohydrates, convert sugar, which could go into storage (fat), into energy. Its Low GI Rating means its slow-release energy – the best type and ideal for sustained activity. For a twist on shepherd’s or cottage pie, replace the traditional mashed potato topping with mashed kumara. For extra flavouring add crushed citrus rind, herbs, or finely chopped ginger. Kumara adds sweetness and bulk to soups & curries, & works especially well with Thai & Indian flavours. Make a creamy soup in a flash by cooking a chopped onion in a pot with a little olive oil. Add chopped kumara, carrot & ginger. Add enough chicken or vegetable stock to cover the vegetables. Bring to the boil, reduce heat & simmer until cooked. Kumaras love warm & spicy flavours... flavour with allspice, nutmeg, cloves, cinnamon, garlic, ginger, red pepper flakes, paprika, thyme & sage.